When Geri Grasvik opened The Pine Needle Quilt Shop in 1992, she had no idea how to quilt or sew. Twenty-five years later, she still doesn't possess those skills. But the lack of needle-related knowledge hasn't stopped her from transforming her store in downtown Lake Oswego into a renowned business that draws customers from all over the country. "I love what I do. I love fabric, I love design, I love color, and I've had the greatest staff along the way," she says. "I still don't know how to quilt, but maybe I'll take a quilting class when I'm retired." Turns out she'll have the time to take that class soon. Grasvik has announced she is retiring at the end of March and closing her business on First Street. A "going out of business" sale is scheduled to begin on March 8 and last through the end of the month, featuring display items, rare fabrics and treasures Grasvik has collected over the years. The Pine Needle will be replaced by a Montavilla Sewing Center in mid-July. Grasvik opened her quilting shop after deciding to leave the fashion industry, where she'd spent 20 years as a buyer at Nordstrom and in wholesale. Although her career had taught her how to purchase fabric, she says, she wasn't quite sure what fabrics to buy or how much to purchase. So she turned to the Yellow Pages and visited a couple of stores to gain advice from local professionals. "I was told I needed to buy 120 different calicos and at least 60 percent of them needed to be blue, because everyone wants blue," she says. "I said, 'Not only am I not going to buy 120, I'm not going to buy one.' They said I was going to go out of business." Instead, Grasvik blazed her own trail, carrying products that other stores didn't. She says she tried to get inside the heads of her customers to figure out what they truly wanted, rather than provide what she thought they might want. She strove to be unique, she says, and believes The Pine Needle has allowed her to do just that. 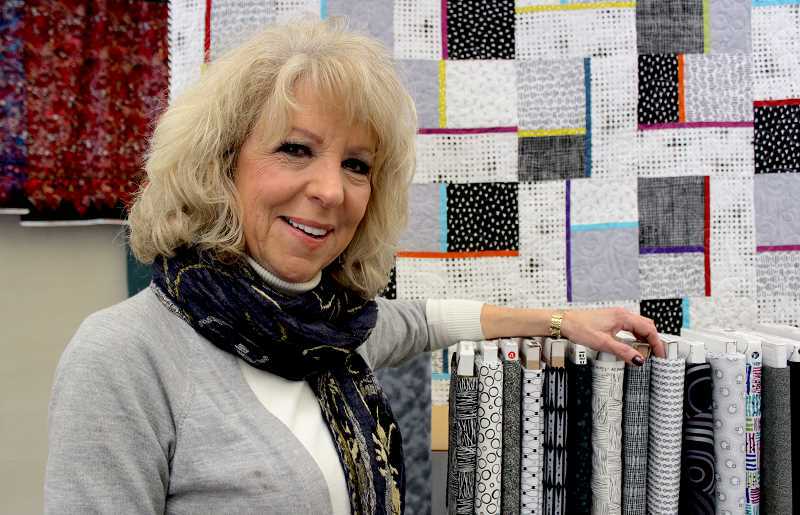 "In 1999, we were a Top 10 quilt shop in the entire nation," she says. "Customers would come from all over the world, with full tour buses dropping these ladies off in front of our store. It was great to meet new people and introduce them to what we do here in the Northwest with fabric." One facet of The Pine Needle's success has been the wide variety of classes the store has offered over the years. Seven days a week, The Pine Needle was a hub for local quilters to learn, interact and socialize. In a way, the shop became its own little community center. Grasvik credits much of her success to two local women, Sandi Ray and Billie Mahorney, who came into her store just a month after it opened in December 1992. Ray and Mahorney laid out their vision for what The Pine Needle could provide to the local quilting community, and Grasvik jumped at the opportunity. "(Ray and Mahorney) were really the roots of the business. I think they're our quilt angels," she says. "The teachers we've had come through here were crucial to the store's success." Before deciding to retire, there were three things Grasvik says she needed to do. The first was to make sure that whoever took over her space would continue to be involved in CARES Northwest, which provides quilts to abused children in local hospitals. To date, The Pine Needle has donated approximately 20,000 quilts to the program. The second was to preserve the classes offered by The Pine Needle and the community of quilters around them. The final condition was that her employees had somewhere to go, and each of these conditions will be fulfilled when Montavilla Sewing takes over The Pine Needle's space on First Street in July. That makes her departure feel less like the end of a story and more like the turning of the page to a new chapter, Grasvik says. "We've been able to develop community groups that have been together forever," she says. "Part of our success was connecting the dots between personalities that wanted to be together and stay together. That's been huge." The closing of The Pine Needle isn't the end of Grasvik's career. In fact, she's pivoting once again into a new role that will see her planning, organizing and leading destination quilting retreats. She's already scheduled a few trips in 2018, including one to Montana, to a dude ranch in Idaho, to the Oregon Coast and to the Hood Canal in Washington. "I want it to be more than just quilting," she says. "I want people to have an adventure and to have an experience. That's kind of what this industry is all about. It's a soulful, creative process that we are involved in."